Greek: Νικόλαος, Nikolaos, "victory of the people". This article is about the actual Bishop of Myra. For the legends of secret gift-givers based on his life, see the individual entries, e.g., Santa Claus, on those legendary characters. Saint Nicholas (ca. 270-6 December 343 AD) was a bishop in the pre-Constantine church, a delegate to the Council of Nicaea, and a true champion of justice—a quite honorable enough memory for any man. Today, most people remember only his name, a name they attach to a God-substitutionary mythical figure with a reputation for secret gift-giving and the bestowing of rewards according to works rather than grace. Nicholas was born between 260 and 280 AD into a wealthy family in the village of Patara, in the Roman province of Lycia, part of ancient Asia Minor and also part of modern Turkey. His parents perished in an epidemic while he was still a young man. Inspired by the words of Jesus Christ to the rich young ruler, Nicholas literally sold what he had and used it all to aid the poor, the infirm, and the suffering. He swiftly gained a reputation as a man of God and became quite popular in the city of Myra because of his many charitable activities. Indeed, in a highly unusual move, Nicholas won election as Bishop of that city, though he was a layman. The Roman Emperor Diocletian, one of the worst of the persecutory Emperors, banished Nicholas and had him imprisoned. Then, in 305 AD everything began to change with the coming of Constantine. Roman persecution in the eastern half of the Empire continued until AD 311—and then co-Emperor Galerius died, and his successor Licinius instituted a tolerant policy. Nicholas thus won release from prison and returned to Myra. One of Nicholas' first acts upon his return seems to have been the destruction of multiple pagan shrines and temples. Chief among these was the Temple of Artemis. Accounts contemporary to the period state that these shrines and temples were infested with demons. Nicholas fought as hard as he could to have these buildings thrown down, in a manner that would have pleased Kings Hezekiah and Josiah of Judah, and possibly the Prophet Elijah. Demons or no, Nicholas' reported actions in destroying these temples are probably real enough, and indicate that Nicholas was as militant as he was generous and charitable, when he felt that militancy in the service of God was called for. Nicholas' career as Bishop of Myra was quite illustrious. Multiple accounts credit him with relieving a famine in Myra (311-12 AD) by requesting donations from several grain-laden ships in the harbor. The accounts state that Nicholas promised the crews of those ships that their donations would not be missed at destination—and miraculously, they were not, even though Nicholas had quite enough grain to see the people through two years of famine and even to plant a new wheat crop at the end of that time. Nicholas is well-attested as having attended the Council of Nicaea in AD 325. One account, which might or might not be completely accurate, states that Nicholas confronted the famed heretic Arias (who denied the Trinity), even going so far as to slap him across the face. For this Constantine temporarily relieved him of his bishopric and even had him imprisoned for a brief spell. The account also says that Nicholas was eventually reinstated. 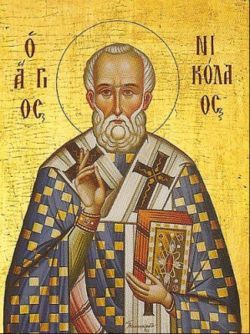 Nicholas is also credited with personally stopping the execution of three wrongly convicted men (and later seeking to clear their names), and with interceding with Constantine for a tax reduction for the citizens of Myra. Nicholas died on December 6, 343. When he died, a mysterious liquid substance regarded as similar to manna reportedly formed from his grave. For that reason the Roman Catholic Church eventually canonized him. The anniversary of his death was thereafter known as Saint Nicholas' Day. This persistent legend about Nicholas arises from his charitable activities. According to one account, he secretly gave three bags of gold—or three gold balls—to three young women who lacked dowries, by throwing the gold into their houses at night. The gold happened to land inside the stockings that the women had hung up near their fire hearths to dry. Modern western countries perpetuate a story of a giver of gifts who enters homes by stealth, leaves generous gifts, and departs as secretly as he came. In the British Isles this figure is called "Father Christmas," and in France, Père Noël. The Dutch call him Sinter Klaas, which is the literal translation of "Saint Nicholas" in Dutch—and in the United States, thanks largely to popularizers like the author Clement Moore, he is called "Santa Claus," a corruption of the Dutch name. In Germany he is known as "Kris Kringle," which is a corruption of the German name Christkindl, literally "Christ child." Perhaps by no accident, "Kris Kringle" is always associated with the cone-shaped "Christmas tree," or Tannenbaum, which is a German invention that itself traces to a pagan practice that began in that region. ↑ 1.0 1.1 1.2 1.3 1.4 1.5 1.6 1.7 Authors not available, "Who is Saint Nicholas?," The Saint Nicholas Center, 2002-2007. Retrieved April 16, 2007. ↑ 2.0 2.1 2.2 2.3 2.4 2.5 Authors not available, "Was Saint Nicholas a Real Person?," The Saint Nicholas Center, 2002-2007. Retrieved April 16, 2007. ↑ 3.0 3.1 3.2 3.3 3.4 3.5 3.6 Ted Olsen, "The Real Saint Nicholas," Christianity Today holiday newsletter. Retrieved April 16, 2007. ↑ Authors not available, "Nicholas and the Temple of Artemis," The Saint Nicholas Center, 2002-2007. Retrieved April 16, 2007. ↑ Authors not available, "Famine In Myra or The Miracle Of The Grain," The Saint Nicholas Center, 2002-2007. Retrieved April 16, 2007. ↑ This particular miracle, if true, recalls the miracle of the endless pot of oil that Elisha performed for a poor widow hard-pressed by creditors. ↑ Authors not available, "Tax Relief for Myra," The Saint Nicholas Center, 2002-2007. Retrieved April 16, 2007. ↑ Anonymous, Saint Nicholas, French Ministry of Culture. English version retrieved April 16, 2007. ↑ The elaborate myth of Santa Claus' Arctic toy factory and unequaled transport and delivery system probably reflect Americans' confidence in their country's industrial might more than any of the qualities attributed to Nicholas himself.